Premise- One contestant competes against a team of two contestants. The contestants play on a 5×4 hexagon board, with each hexagon containing a letter. Every question is a toss-up question and a contestant can buzz-in in the middle of the question being asked if they know what it is. If a contestant answers a question correctly, the hexagon will turn to the corresponding color of the contestant/team and they will get to choose another hexagon. The contestant/team will also be awarded £5 for every correct answer. 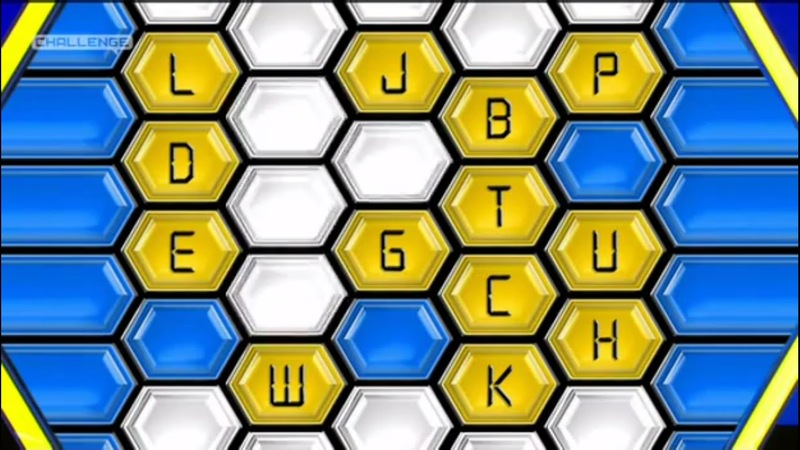 The solo contestant (represented by white hexagons) has to make a vertical connection with a minimum of four correct answers. The two-player team (represented by blue hexagons) has to make a horizontal connection with a minimum of five correct answers. The first team to win two games will win the match and plays the Gold Run bonus game. In the Gold Run game, the champion will have 60 seconds to make a horizontal connection with a minimum of five correct answers. If they answer a question incorrectly or pass on it, a block is placed on the board and they will have to work their way around it. If they successfully make the connection, they will win a special prize. If unsuccessful, they will win £10 for every correct answer. If a contestant /team plays five straight Gold Run games, they will be forced to retire undefeated. Of all the Blockbusters revivals, I think this one will have a very good chance of being the most successful and running the longest. Challenge TV did an excellent job of reviving this game show, maintaining the same fast-paced gameplay and competitive atmosphere as in the original, and maintaining the “are two heads better than one?” aspect of the show. Before watching the 2012 revival, I originally didn’t care for U.K. version of Blockbusters because I was spoiled with the 1980 U.S. version with Bill Cullen hosting, with his quick wit and humor. Simon Mayo is an excellent host who keeps the show going at a quick pace, like Alex Trebek with Jeopardy!, while taking enough time to get well acquainted with the contestants, which is somewhat rare nowadays with today’s game shows. I also like the enhanced set using the contestants’ and Gold Run color scheme and the show’s updated electric guitar-lead theme. The only criticism I have about the show is the show’s prize budget. The cash award needs to be increased to at least £50 per correct answer and the Gold Run consolation prize of £100 per correct answer. Despite the cheapness of the main game, the Gold Run prizes are cool and unique such as the Sports Car Driving Experience or a One-Night Luxury Getaway Vacation Package. Overall, the 2012 Blockbusters revival is an excellent, competitive game show that is fun to play along while viewing. The network’s website gives their viewers a chance to play against other players online with the Blockbusters online game. From Simon Mayo as the host to the new Blockbusters board, Blockbusters is a terrific show to watch and I can see this show being renewed for another season and hopefully many, many more. For U.K. viewers, watch new episodes of Blockbusters weeknights at 8:00pm on Challenge TV! For everyone else, you can check out episodes of Blockbusters on YouTube!